Any Discounts will Auto Calculate! This is a "while they last" sale. Once they are gone, they are gone. We'll do the orders first in, first out, if we run out of something, we'll contact you to make another choice. Each Blank is square, measures apprx. 3/4" x 2-3/16" and already has a 27/64" tube in it. These gorgeous blanks just bring to mind nature and Harvest time with their rich metallic fibers. They have a beautiful shine to them when the light bounces off the blank. These will definitely appeal to those that love the earth tones. AWCIG is cast on the upper and lower cigar pen tube. 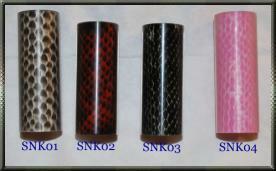 Designed for the Cigar or Monet/Celtic3/Gatsby/Sierra type kit. Tubes already in the blanks. Designed for Cigar and Monet/Celtic3/Gatsby type kits.